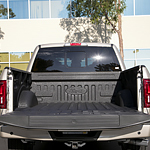 The Ford F-150 is on a mission to deliver top capability and performance. It carries up to 3,270 lbs. of payload and tows up to 13,200 lbs. when properly equipped. Its aluminum-alloy body is bolstered by a full boxed frame that is forged from up to 78 percent steel with high strength. You get plenty to tech to entertain you, keep you safe, and to optimize your trips on any road. One of the six engine choices in the Ford F-150 is the Power Stroke® 3.0-liter Turbo Diesel V6 that tows up to 11,400 lbs. while pushing out 250 horsepower at 3,250 RPM and 440 lb.-ft. of torque at 1,750 RPM. Another is the 5.0-liter V8 that relies on Direct Injection and Twin-independent Variable Cam Timing to produce 395 horsepower and 400 lb.-ft. of torque. Come to Mullinax Ford of Kissimmee today so you can test drive the Ford F-150.